Looking for our current event line-up? Click here for our upcoming events! Thanks to The Grove Coffee House, and all of our fantastic local recreation experts, our second annual Watershed Recreation Fair was a great success! Plus, the Salem Water Otters held a raffle that raised $57 for the Luckiamute Watershed Council! Woohoo! A big thank you also goes to all of you who stopped by, and for those who didn't get a chance - mark your 2020 calendars because we'll be doing this again next Spring! We had a group of 12 landowners and community members come out to Monmouth Public Library to hear about our Temperature Monitoring Program goals and findings so far. LWC Monitoring Coordinator Caleb Price explained why water temperature matters to aquatic life and share results that show how different waterways in the Luckiamute watershed are faring. Want to learn more about the LWC's Temperature Monitoring Program or have questions about stream temperature in the watershed? Contact Caleb Price at Monitoring@LuckiamuteLWC.org! ​More than 60 people came out to The Valkyrie Wine Tavern to listen to Jerry Paul, Benton SWCD board member, give a presentation on the mason bee. Not only did everyone thoroughly enjoy some GREAT fare courtesy of The Valkyrie team, Jerry's fascinating account of the invaluable contributions that this native pollinator makes to food production and ecosystem health wowed the entire room! If you missed this presentation, click here to view it on YouTube! Wow! Our first Sips 'n' Science pub talk of 2019 brought Brew Coffee & Taphouse to full capacity at 52 attendees! This time, Kelly Dirksen - Fish and Wildlife Program Manager for the Confederated Tribes of Grand Ronde - shared the fascinating life history of the Pacific lamprey, and described how local Tribes are helping to restore populations of this 650-million-year-old, eel-like fish in the Willamette basin. Best of all, if you missed this presentation, you can now view it on YouTube at https://youtu.be/x789W-Ecyes! On November 15, NOAA Research Fisheries Biologist Dr. Chris Jordan explained why partnering with beaver makes sense for many stream restoration efforts across Oregon. We had a FULL house with a total of 62 attendees at The Valkyrie Wine Tavern, which served up some delicious food and wine during Dr. Jordan's presentation. On October 6, local naturalist and bird expert, Joel Geier, took bird walkers through the unique "striped" landscape of Luckiamute State Natural Area's South Unit, where oaks grow on gravel ridges while prairie and ash trees grow in the swales left by old oxbows and side channels of the historic Willamette River. During this beautiful fall day, participants got to see many kinds of sparrows, goldfinches, yellow-rumped warblers and kingfishers, just to name a few! Then on October 21, Joel led a group of 15 bird-walkers along the Richard Guadagno Memorial Loop trail at Baskett Slough National Wildlife Refuge. Cool morning temperatures kept the birds quiet early on but not long after the sun warmed things up, everyone was treated to the lovely song of our state bird, the Western Meadowlark! On September 23, 2018, we had the opportunity to take a closer look at some of the restoration work going on around the Luckiamute River and its confluence with the Willamette. The Luckiamute Confluence Tour was the first event in our 2018 - 19 Love Your Watershed series, and gave participants the chance to learn about what the LWC and some of its partners are doing to protect and conserve native landscapes and river health within our basin. Tour stops included the Jont Creek restoration site (private), Willamette Bluffs Conservation Area (private) and Luckiamute State Natural Area. 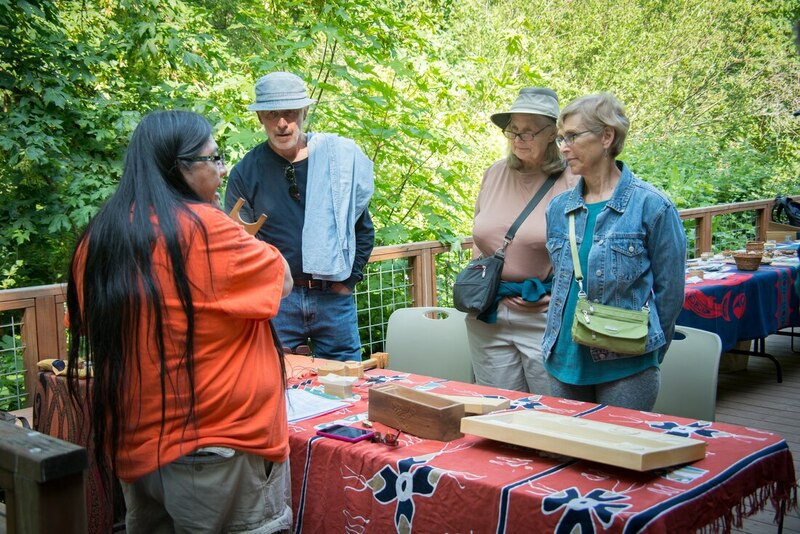 During our June 5 Native American Ethnobotany of Western Oregon workshop, held at Beazell Forest Education Center, Grand Ronde Tribal representatives - Greg Archuleta, Lorraine (Bejee) Barton, and Devon Robinson - wowed all of our participants with their knowledge, stories and presentations of the uses of native plants by The First Peoples of our region. Workshop attendees not only got to participate in some hands-on table activities, they also had the opportunity to hike along Beazell trails with Greg Archuleta, learning to identify native plants and how they were (and are) used in Native culture, cuisine and medicine.